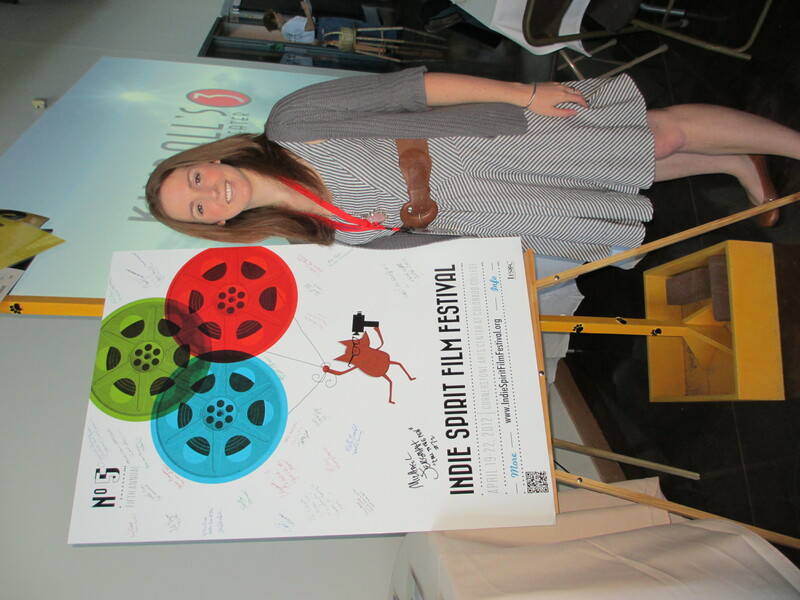 Indie Spirit Film Festival success! I’ve been pretty bad about updating, but between facebook and traveling and watching so many amazing films, I just wanted to enjoy my time at the Indie Spirit Film Festival. It was my first time attending a major festival as a director and I honestly felt like a celebrity! My filmmaker badge allowed me to attend any screening, all the parties, and opened the door to conversations I may not have had with other film enthusiasts. Here’s a picture of me at the festival! I’m proud to announce that Speed of Fencing is screening in New York again! It is the first short film to play at the NewFilmmakers Spring 2012 show on April 15th. Unfortunately, once again for me, I won’t be able to attend because of US Nationals. (I swear, it’s like they knew.) Anyway, below is more about NewFilmmakers from their website. Come and check it out if you’re in the area! The NewFilmmakers Series was begun in 1998 by NYU Film Students in order to show their work and promote themselves in New York film community. Then, and now, most festivals and screening programs in the city only screened known and established filmmakers and there were few that are open to new filmmakers. screening series and over the past fourteen years has screened over 600 feature and 2,000 short films. In 2000 we brought the Havana Film Festival to New York and in 2002 we started the highly successful NewFilmmakers Los Angeles. Recently we started NewFilmmakers Online. NewFilmmakers screens a wide range of films including animation, documentaries, shorts, and features. Many are films and videos overlooked by traditional film festivals. NewFilmmakers NY screens every week and sometimes more at Anthology Film Archives on the Lower East Side. NewFilmmakers also programs the Soho House Screening Series in New York & Los Angeles. Going to the Indie Spirit Film Festival! ISFF has showcased an average of over 100 films from all over the globe, covering a variety of subjects and genres in its first four years. The festival has quickly become Colorado Springs’ largest film festival, with numerous filmmakers and film fans attending screenings, Q & A sessions, filmmaker panels, parties and receptions. Boasting a broad, unrestricted selection of films, ISFF presents genre-specific awards, as well as Best Short, Feature, Documentary and Festival Director’s Choice. Several films from previous years have achieved further success on the festival circuit and many films from all four years are available on DVD. Now in its 5th year, the 2012 Indie Spirit Film Festival will take place April 19-22, 2012 on the Colorado College campus.